In Tres Bandidos , Shep, David, and Luke get lost on the way to a planned bank robbery and hole up in a dingy Texas motel. As a storm roars outside, past demons and a ticking clock put the heist in jeopardy and push the outlaws toward the breaking point. Written with rapid-fire, cutting dialogue, this contemporary western places cowboy mentality in the crosshairs. "...For all the resonance of the situation and the familiarity of the character types, Lucas's new 80-minute one-act lacks something any decent western (or heist tale or love story) should have: dramatic tension. Since a crucial piece of information is withheld from the audience-I mean, not even hinted at-until the final moments, we can't know what the stakes are, much less wonder what's going to happen if the information comes out. Consequently, the interactions among our three antiheroes carry no charge. That conversation about great westerns? So much dead time. Ditto the poker game and the inevitable backstory speeches. Then, when the revelation finally occurs, the trio's reaction makes more noise than sense." "...Fight director Hannah Tarr and weapons master Edward Karch ensure that the inevitable gunfire is firmly integrated into the dramatic action, Chas Mathieu's scenic design invokes stark flatlands and sun-baked stucco cells, and the close quarters in the Heartland studio are rendered even more claustrophobic by lighting designer Ellie Humphrys and sound designer Ryan Wiechmann's replication of an electrical storm so real as to completely erase our memory of a balmy summer evening on Glenwood Avenue during its tension-filled 65 minutes." "...Eventually, things start to come to a head, as the hour grows late, tempers flare and some interesting discoveries are made, and by this point, Lucas has succeeded in getting us on the edges of their seats. Will the bank heist happen? Who makes it out and who doesn�t? Who�s hiding something (the answer: everyone, from the very get-go, it seems) and who makes it out of this messy affair. We�ll leave the answers to those questions for you to find out, as with the great performances of Wicke, Lino and Lucas, great set design and lighting, and a solid story by Lucas, we can definitely recommend checking this one out." 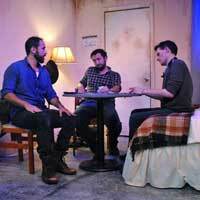 "...Instead of disdain for these men, the playwright, Cody Lucas paints a portrait that elicits empathy. These are men in trouble. Life has gone terribly wrong and they have no skills to seek restitution or resolution. They choose passive aggressive, violent communication, competitive poker playing and sarcastic one-liners against one another on full display."